What are "Tools for Transformation and Healing"? Our Tools for Transformation and Healing are physical objects designed and hand crafted at The Mesa Creative Arts Center by Artist and Healer Brad Silberberg that receive, channel, activate, rebalance, enhance, slow down, direct, or amplify different bands of the spectrum of what are known as "subtle" or "etheric" energies so that we can more directly absorb or use them for our health and betterment. They facilitate positive change, raise vibrational levels, and create an atmosphere of upliftment. They promote energy harmony and balance for us either by creating a more healthy energy environment around us in our homes or workplaces, or by directly changing our internal systems as we work consciously with them in hands-on healing for self or others. Tools like our 4-ring Heliospheres (also known as Genesa crystals) energetically clear and charge objects, environments, or even people on many levels all at the same time, while others (Pyramids, Enspirels) "bring in" other helpful Spiritual energies that would not otherwise be present. Objects like our Portals are doorways to other dimensions, their beneficial energies, and benevolent inhabitants or act as keys to activate or open things up. 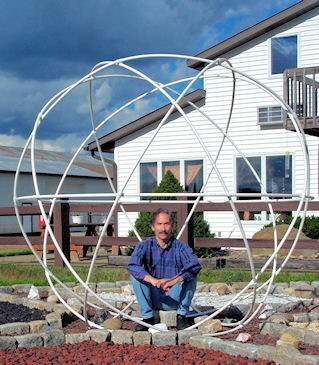 Sitting in our 6-ring Heliospheres (what some call a “Pentasphere”) enhances meditation and healing sessions and can be an opportunity for a “download”, receiving a “package” of instant healing or spiritual knowing from the higher realms. 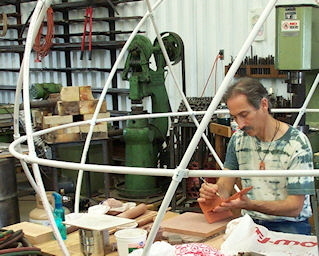 Artist and Healer, Brad Silberberg Sitting in 8 ft. Heliosphere. These spiritual, healing, inter-dimensional, and Life Force energies we are talking about (called "Chi" in China, and "Prana" in India’s Hindu culture) are available to help us heal ourselves, expand our consciousness and awareness, raise our personal vibration frequency, and transform our lives. They are emanated by every living and what is commonly considered "non-living" thing in the Universe and flow in endless supply within all of Creation. Some are present in the unseen world here on Earth while others exist in higher Spiritual dimensions, but no matter where they exist they can be accessed and used from right where you are. Throughout the ages, Humankind has created physical objects (sacred, magic, or “power” objects) that aid in doing so, to add ease or greater power to the process. Our Mesa Creative Arts Tools for Transformation and Healing are just such creations. Through a combination of intention, sacred geometry, understanding of underlying energy structure, intuition, channeled information from the Spirit World, and high craftsmanship, we create simple objects that interact with subtle and spiritual energies in powerful ways. Some are configured and structured to bring in greater amounts of highly spiritual, high vibrational, helpful energies to fill your environment the way a TV set brings in your favorite program into your living room. Others hold open doorways for energies or consciousness to more easily come and go between dimensions to do their healing, enlightening work. Some act as amplifiers and intensifiers for intention or transformative energies, or direct those energies for specific purposes like charging crystals or water. A few are small enough to be worn around the neck or carried in a purse or pocket, while others are big enough to accommodate seated person or a massage table. All have been made manifest here on the physical plane to benefit our healing and personal growth and that of the planet. If these energies are all around me all the time, why haven’t I noticed them? It all starts with AWARENESS, and awareness is controlled to a great extent by belief. If your belief system totally excludes the existence of anything that cannot be noticed with your 5 physical senses, then you are very unlikely to notice them even if they stared you in the face. Those who are very narrow-minded and closed to new ideas or experiences usually don’t want their little boat rocked by consciousness expanding phenomena. Others who may have been traumatized by life’s mean experiences may simply not want to notice much at all, closing the shutters (or barn doors) of their perception in order to cut themselves off from anything that might cause further hurt. In many cases, some perceptual retraining may be in order to open ourselves to noticing what is right with us all of the time. Our Human systems are so sensitive that we have needed to become very selective of what and how much our minds actually notice in order to maintain our sanity. Our unconscious perception receives thousands more stimuli every second than our thinking minds can process and our conscious perception (what gets our attention) is often ruled by our experience and emotional state. Add to that the fact that we have been trained by family, school, and society to quickly notice particular things and also to completely ignore others. This is evidenced by the great number of adults who once saw angels, auras, or fairies when they were little children, and recollect gradually losing that ability. Our current mode of highly filtered perception is a result of our experience and training, but it can be reconfigured. When you get new tires on your car and first drive off the lot, you really notice the difference in how your car handles. “Wow, these new tires are great!” you might say. “It’s much easier to steer this thing and the ride feels more solid than it did before.” But, in the next few days when you’re tearing off late for work, are you still noticing the difference in how your car handles? Probably not. In addition, we tend to fill in a lot of perception from memory, which is why your best friend may not have noticed that you got new eyeglasses. So that’s the tricky bit, taking the time and tuning our attention to notice finer and finer things in our environment. (Like “stopping to smell the roses”, only on a greater scale.) It helps if you’re able to really relax, as when we are tense and distracted by internal or external stress we notice far, far less. Besides this “subtle” energy and bird calls, what other kinds of energy experiences are we exposed to everyday that we may not be noticing? Do you feel the Earth’s gravity pulling down on you as you sit reading this? Gravity is a form of energy that you are constantly exposed to, yet you probably don’t experience it in a direct way until you pick up something heavy and feel your muscles straining. Every moving object generates “gravity waves” that can be calculated from their mass and speed, but have you ever felt an oncoming car without seeing or hearing it first? You’ve probably played with magnets and felt them attract or repel each other, but what about the tremendous amounts of electromagnetic energy from electric power lines, radio waves, cell phones, etc, you are constantly being exposed to? You may only notice them when you stand next to a big electric transformer and feel the hair stand up on your arms. You’re probably aware of light, heat, and sound, but what about the nuclear forces that bind all matter together. As a species, we Humans know these energies are there because our scientists have learned to predict and measure them in relation to other things, but we rarely experience them directly. Animals and plants are quicker to react to changes in weather or an approaching earthquake than we are because they FEEL and pay attention to them coming and act accordingly without “reason” getting in the way. So much of how we operate and navigate through day-to-day living is based on our inherited ability to sense energy on higher levels. 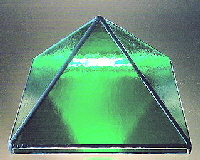 Yet while modern man uses the very steady and accurate vibrational energy of quartz crystals to regulate clocks and watches and make computer chips, these subtle (some would say Spiritual) energies that so greatly affect all life are not yet widely accepted by "Science" (save maybe for the study of Quantum Physics). This is largely because they cannot be detected and "certified" within our current one-size-fits-all technology-based system of using THINGS instead of our own perceptions to decide what is "real" for us. Many of us are willing to accept “Science’s” second hand pronouncements and biased assessments as truth, but reject our own sensations, experiences, and innate knowing as “imagination” because they don’t meet the scientific requirements of “reproducibility” and “logic”. While scientists have fallen down on the job because their methods are too primitive to construct a sensitive enough instrument to detect these fine vibrations, they continue to refuse to accept the perceptions of the most sensitive among us as to the possibilities contained in the vast sea of unseen energies and consciousness all around us without mechanistic proof. Yet hope remains. There exists an instrument that can and does detect and assess these subtle/spiritual energies; the most sensitive instrument on the Earth: The Human Being! Many people are completely unaware of these energies purely because they have never been shown how or taken the time to sit still, turn off their thoughts, and turn their attention to them, but you’ve probably had some experience with them without recognizing it. You’ve known someone walked into the room without seeing or hearing them. You’ve felt the beauty of a rose, or how much someone loved you. You’ve had a friend call just when you were thinking of them, or felt something “stale” in a cramped motel, store, or workplace. With a little practice, you too can feel, assess, and appreciate the energetic and spiritual help that is available from the Natural World. If you take the time on a regular basis to sit with a plant, crystal, sacred object, or one of our Tools for Transformation and Healing, they will help clear out your mind and your senses so that you will more firmly perceive the energies they contain. Now that you’ve learned a little bit about energy, take a look at what our individual Tools for Transformation and Healing have to offer. Some of them we can describe to you in terms of what they "do" and others we just don't have words for yet. We suggest that trust your own intuition and guidance and just experience them for yourself.